Be aware that the information provided here is an overview of transistors in a general sense. Transistor circuit analysis (the nitty gritty) which is a part of microelectronics, involves an understanding of electric circuit fundamentals, and also considerable experience solving circuits using equivalent circuit models (lots of diagrams and math). If you want the nitty gritty, my best advice to you is to watch online video lectures that are being taught by university professors, like those by rolinychupetin YouTube channel. These online video and tutorials are long and in depth. I highly recommend starting with the BJT videos. The transistor is a 60-year old component that amped computer technology up to what it is today. The first transistor was invented in 1947 by William Bradford Shockley, John Bardeen, Walter Brittain. (More on Transistor History). Today, transistors are used in computers, robots, and many other creations that rely on logic. Transistor logic is accomplished by combining the switch like behavior of several transistors together. Interesting Fact: The name, "Transistor" came from "Transforming Resistor." It is surprising, but the transistor is really a resistor that changes its resistance valuedepending on the input signal. Bipolar junction transistor with labeled pins (E,B and C). 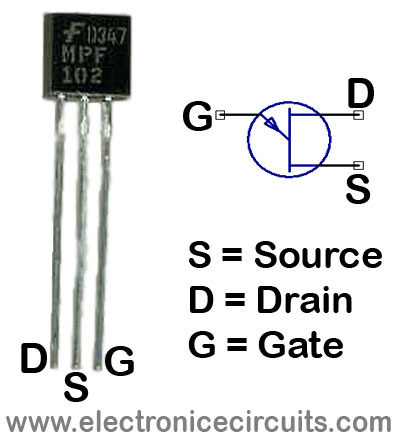 The side facing you is considered the back of a transistor, in which has a semicircle shape. 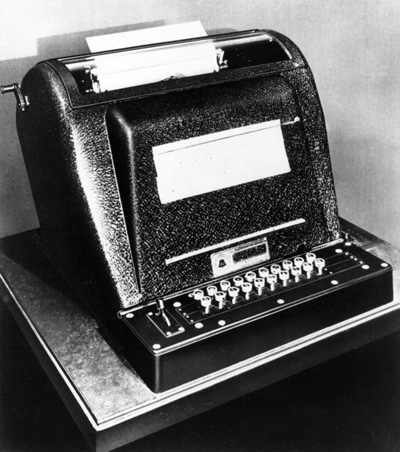 The front contains numbers (usually in white ink) used to locate data sheets that go with the specific transistor. What is a switch or an amp anyway? Try and define them yourself before reading on to get yourself thinking. A SWITCH is a device that allows you to change values from on to off. This is also known as toggling. Such as the lights in your bedroom, they can be ON or OFF (two different values). The ON/OFF values are also referred to as "states" or more completely, "logic states,", in which ON means True (like "Yes") and OFF means False (like "No"). AN AMP is a device that increases an already defined value. A simple amp is a guitar amplifier. Notice amp is the start of the word amplifier. With a little twist of thought a switch is an example of very an extreme amplifier. A switch is an "absolute" amplifier. What I mean by this is that a switch is usually 2 values that are extremes of one another (ON or OFF). An amplifier can be used to increase precision as well as distort precision of a value. The softer the guitar gets the harder it will be to hear. a. An amp is used to _____ an already existing value. b. A switch usually has only ____ values. c. A standard transistor has ___ metal pins. There are two sub-types of bipolar-junction transistors: The NPN (on left) and the PNP (on right). NPN stands for "Negative Positive Negative"! 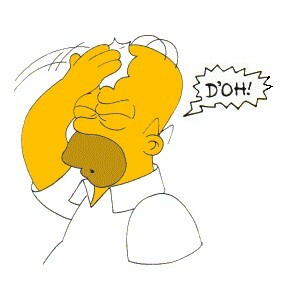 PNP stands for "Positive Negative Positive"! In order, the bipolar junction transistors' 3 metal pins (also known as leads) can be remembered by E.B.C. = "Eat Big Cookies". The difference between NPN and PNP transistors is the direction of the flow of electricity (current). In the images above you can see that from bottom to top the NPN pins are EBC ("Eat Big Cookies") and PNP pins are CBE (the reverse order). -An important note to make is that the B or BASE pin of the transistor is always in between the C (collector) and the E (emitter). -Also, the NPN and PNP bipolar junction transistor both have their arrows pointing from base to emitter. When buying the standard JFET transistors, both NPN or PNP, keep the NPN and PNP transistors in seperate labeled bags. It is very difficult, tedious, and down right frustrating to sort through a mixed group of JFETs (PNP and NPN). So, when you buy transistors, buy a SET OF NPN (maybe 20 or so) and keep them all together, in addition to a SET OF PNP (20 would be plenty for basics). a. The letter, "e" stands for ______. b. The letter, "b" stands for ______. c. The letter, "c" stands for ______. d. The base pin is always between the ______ pin and the ______ pin. e. NPN stands for ___________________. -size (think about the tiny ones in your computer)! Transistors come in a high voltage from and low voltage form. The low voltage use transistors (JFETs) tend to be smaller than the high voltage use transistors (MOSFETs). JFET stands for Junction Field-Effect Transistor. Did you know that microprocessors (CPU*) have millions/billions of microscopic transistors in them? Fresh reminder: Transistors are just special resistors. Not only is it true, but it is an extremely important part of the computer. The microprocessor (millions of transistors and other micro electronics) is in charge of LOGIC and CALCULATIONS (Processing). *Technically, CPU stands for Central Processing Unit which is a part of a microprocessor so the terms are not equivalent (technically). However, in the real world people use the terms CPU and microprocessor interchangeably. Due to the fact transistors can act as switches, combinations of these switches/transistors can be used to represent data. When combined correctly transistors can function together as AND, OR, and NOT gates (AOI logic). AOI stands for And Or Invert. More on AOI and Logic later. The average discrete transistor (both bipolar-junction and field-effect) is about 1.5 cm long. Now, can you imagine squeezing millions/billions of transistors into a CPU (Central Processing Unit) that is only about one squared inch big?! If it weren't for transistors, you would not be on my site reading this right now. b. What does GDS stand for? 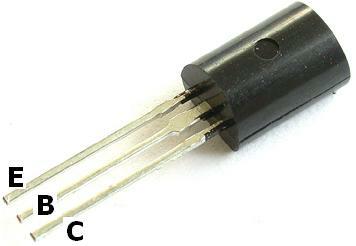 c. MOSFET stands for Metal-Oxide-___1c____-Field-___2c____-____3c_____. d. JFET stands for _____________. e. TTL stands for ____________. b. Bipolar-junction transistors are often abbreviated as _____'s. c. Transistors two basic jobs are: __________ and _________. 10 Significant Steps Toward Blogging Success! 1. Blog about a topic that you truly enjoy and know a lot about. 2. Try to post at the very least on a weekly basis. 3. Do not include risky material, such as racist jokes. 4. Share all of the resources you like and use. Your followers will appreciate the suggested resource, and will come back to you for more resources. 5. Do not have so many ads that your blog is difficult to read or view. 6. Revise and improve your old posts! It takes less time and creates more popularity for your blog. One amazing post is worth more than 1000 bad posts. 7. Follow and learn from other blogs that are in your niche, or category of content. 8. Create posts about information that no one has seemed to post successfully. 9. 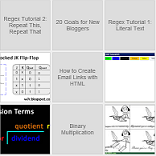 Keep your blog organized and neat. 10. Provide Email contact and comment posting so you can show your dedication to your readers. 2. Think about a logical way to fix your problem without just jumping right in. You could write it on paper or on a word document or even draw pictures and diagrams of fixes or adjustments for your project. 3. Do something that makes you feel good! 4. Promise to yourself that you will learn from this nightmare project. 5. No shame in asking a friend for help or simply telling a friend about the project. We all need to vent out a little. Even Chuck Norris. Feel free to email me about your dilemmas and I'll be glad to read and respond. This picture is even more helpful because it labels the Cathode and Anode of the LED. Do you see the arrows pointing out from the triangle in the schematic symbol? That is light energy that is released when the electricity passes from the Anode to the Cathode. 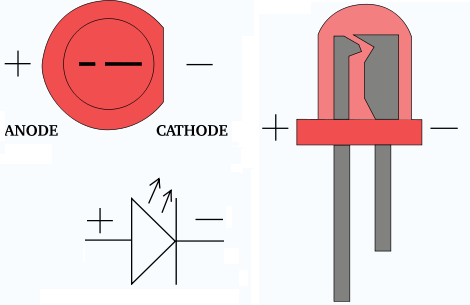 A Cathode is known as the "Negative Lead" and the Anode is called the "Positive Lead." The light waves (photons) are created when the electricity arcs over from the PLUS (+ Anode) lead to the MINUS (- Cathode) lead of the LED. An led runs on a minimal amount of electricity (about 1.5 to 2 V). The larger the LED, the more electricity it will most likely need to function. The Anode, the positive and longer side of the LED, also can be identified by the flat side of the LED. This is handy when you have leads that are the same length. If you have heard of an electric arc then that is what you should think of an LED light as. A very small electric arc. The material used in the LED determines the color it will create; not the color of the plastic. Usually the plastic will be the same color as the light, but on occasion you will be using white colored LED's that release blue, red, green light. An LED supplied with too much power will break, similar to that of a fuse, but the LED is not created to be used as a fuse (fuses break upon excessive current (Amperes). -buy an appropriate resistor for each LED you purchase. 1k Ohm would work in most DIY projects (BROWN - BLACK - RED - ANY). For most projects the fourth band of the 4-band resistor is gold. when a 4th band is golden, it has a 5% tolerance. LED Tetris with an Arduino Chip! I am excited to share this video with you and explain a little bit of what is going on in this program/project. The tetris grid is made of 16x16 LEDs or 256 LEDs! If you are unfimiliar the term LED, it stands for "Light Emitting Diode," and is (in simple terms) a light. So, LEDs emit light. The Arduino chip is used to tell which LEDs to light up at a given time. It would take an extremely unreasonable amount of space (or memory) and time to program all combinations of the 256 LEDs in their ON or OFF state. To avoid wasting time, a program that can execute decisions in nanoseconds (.000001 second = 1 nanosecond) is updating the LED changes on the fly. When a certain time has past in a game of Tetris, the Tetromino (group of blocks) moves down by one unit which requires an adjustment of the states of a few LEDs. There is no need to change all 256 if only the borders of the tetromino could have changed state. I have an Arduino Uno that costed around $25, that I plan to create Tetris on sometime soon, before my big project: 8x8x8 LED cube. I am hesitant to add a 3rd dimension to my projects until I have mastered 2-Dimensional projects. Arduino is a very fun gadget because it bridges the world of Computer Science (Digital World) with Engineering (Physical World). The Arduino makes decisions using logic gates which all rely on microsized transistors, just like our computers. Though, our computers rely on zillions of transistors packed up into a chip called The Microprocessor. Arduino is the name of the chip or device which is used to record and execute programs that normally involve more than just a console (Print out screen). Usually, an arduino project include LEDs (Light Emitting Diodes), speakers, motors and utilize digital logic to solve complex problems. 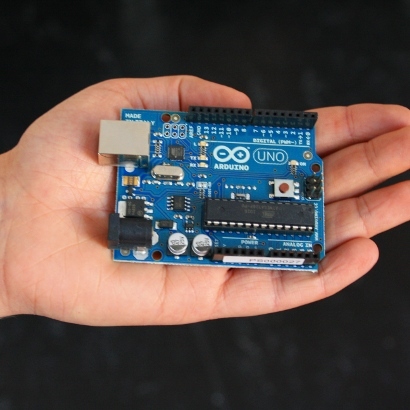 Arduino's are made in Italy and are part of the open source movement that you may be interested in: http://arduino.cc/ . 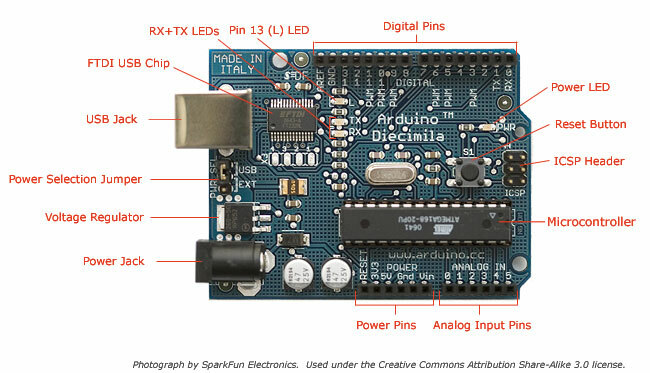 Here is a good diagram that identifies various components on the Arduino (Arduino Diecimila). The programming in Arduino is relatively simple, but I am biased because I have been programming for a while now. Arduino code filed are called "sketches." So feel free to search around for sketches being exchanged or shared on websites. They are everywhere. Let's take a look at some of the interesting projects people completed with the Arduino. For instructions for your own Arduino projects skip to bottom of post. Without energy you can't get your ideas into code. Short and simple. If necessary, have that one extra coffee to finish the job. If you need additional help, motivation, or energy it is best to find a few friends who would like to help create the app. 2. Mediocre Programming skills Or Above. Even if all you can do is display images, prompt users for input, and use if else statements, you can create an interesting app. (of course more experience helps, though!) Don't get to know a thousand languages sort of well. You are better off specializing your skills in one particular programming language. My most developed knowledge of any programming language is Java. Coding is not made for everyone, but is worth a try. Feel free to email me Java (or even other languages) questions or comments. 3. 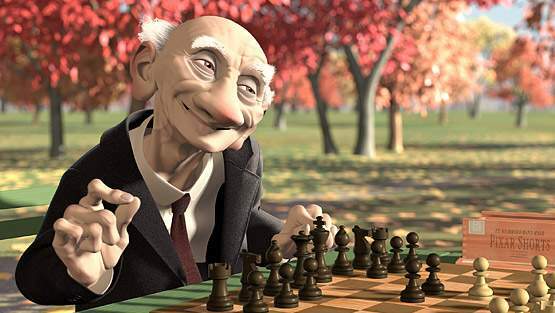 A Creative, Innovative, and Observant Mind. When you create programs, you will get the best response from people who have never experienced such a program. If you are able to create or fill a niche or type of app or game that is unlike the many others in existence, then you are set for success. Imagine how special it would be to be alive in November 11, 1111 at 11:11:11AM. I'm sure it was a lot harder to manage time then than it is today. Has anyone told you to make a wish because it is 11:11AM or 11:11PM? Either way, this tradition was at its climax today at 11:11AM, so I hope you made a great wish! If you forgot to wish before 11:11AM then you can sneak a small one in tonight at 11:11PM, but the effect will not be as strong due to the time being 23 hours and 11 minutes into the day as opposed to 11 hours and 11 minutes. Don't you love numbers?! HAPPY BINARY DAY.